Nadica Nikolic graduated with a degree in marketing and finance management, from the Faculty of Economics, Ss. Cyril and Methodius Univeristy of Skopje, Macedonia. Beginning her career at Nadex, a top global finance and auditing company, she specialised in areas including accounting and inside audit. At Nadex, she was responsible for a great deal of international projects and worked alongside top industry professionals. Nikolic has attended and participated in training schemes and seminars on finance, accounting, marketing strategies and business administration to further her knowledge. She also attends seminars on the installation of solar systems, organised by domestic and international institutions, including the Polysol FP7 Euro Project and Ce ProSARD, by the Association of Solar Energy in Macedonia, as well as the Handwerkskammer Koblenz in Germany. Her knowledge on the renewable industry continues to develop alongside her education and professional experience in the realms of finance and accounting. 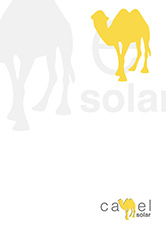 As the office manager for Camel Solar, Nikolic combines specialist knowledge in accounting and business strategy to increase Camel Solar’s efficiency and status.